Sometimes bottomless mimosas on the menu are bottomless in name only. It's not really in a restaurant's best interest to be quick on the refill. When this happens (and one knows right away if this is the case) I spend a lot of time looking wistfully at my sad, empty glass trying to figure out a way to refill it just with the power of my own mind (never works). When I do get a refill I spend less time enjoying the mimosa and more time trying to get my mimosa to a level where the next time the server returns they'll offer a refill without just chugging it down like some sort of weirdo. This is not an issue at Libertine. They say bottomless and they mean it. Our server had a brilliant approach. Any time a single person needed a mimosa, he brought the whole table a new mimosa. That's a great approach if you ask me. I'd like to think that it made his life less difficult as well. I had grand plans to write a long, detailed post about brunch at Libertine. Instead after brunch, Rachael and I went to Magers and Quinn for some tipsy shopping and I purchased the Enchanted Forest coloring book. Someone please tell me coloring all afternoon is a productive way to spend a Sunday. Libertine was great, we had a delightful time. I'd love to tell you about the funny conversations we had or describe my meal in minute detail, but I've got some freaking bark and leaves to color. Amadeus-Chicken and waffles. Perfectly cooked fried chicken with good flavor (although it is no Revival chicken, but that is an unreasonable expectation). Decent little mini-waffles. The chorizo gravy was meh. A-. Rachael-Crepes and grilled broccoli. A-. Judy-Crispy tofu. Wonderful overall, best ever fruit platter, so A -...but crispy tofu needed to actually be crispy. Alex-Soft scrambled eggs with bacon. I say B. I'm really irked by the music, but I get it. Also my eggs were good, but not amazing. I was tired of them by the end of the bowl. Good bacon. Perley-Soft scrambled eggs with bacon. A all the way. Excellent mimosa service. Ample portions of food prepared very well. Sarah-Salmon pastrami Benedict. B. Outstanding mimosa service. Salmon Pastrami Benedict was fine, not something I would order again though. Didn't particularly pick up the "pastrami spices", and would have preferred a more generous portion of salmon and slimmer portion of English muffin. Potatoes nicely crisped, but cold. Overall a good experience. Jimmy-Classic breakfast. Libertine gets a B because my crispy hash browns were not hot. I am not a morning person. There, I said it. So when Perley suggested Nightingale at 9:30, my first two thoughts were "that sounds tasty" and "that sounds early." But, as Nightingale is only five blocks from my apartment, I acquiesced and told him that Maria and I would see him at 9:30. I was right that 9:30 was early (I was also right that it was tasty, but I'll get to that later). My favorite part of brunch is the "unch" element. There is something luxurious about sleeping in and not eating until it's almost lunchtime. Also, it is totally acceptable to order coffee AND beer at brunch. Luxury and beer aside, 9:30 was also early in that Nightingale didn't open until 10. After some coffee and tea at Common Roots Cafe we ventured back across the street just as Nightingale opened. Somehow, we were not the first group in the door. Still, between the doors just opening and our manageable group size (half the size of my initial breakfast with the group) we were seated right away. Perhaps Perley is onto something with this early morning breakfast thing. Nightingale is kind of fancy. This is not, and would never be confused with, a diner. A donut with chocolate ganache made to order? Yes please! Artisan sugar cubes for your coffee? Of course! I'm not an animal! But there are certain times when fancy will not do — corned beef hash and biscuits and gravy. Much like Sarah and her breakfast burrito (which I have yet to see her actually order), I am sucker for corned beef hash and biscuits and gravy. Unless someone has tried to fancy it up. Yams and caramelized onions in my hash? Never! Mushroom gravy instead of sausage? I think not! Thus, my two go-to breakfasts were off the list of choices for me. And for that, I am thankful! The Donut (split three ways): The allure of a made to order donut was too much for Perley. He, Sarah, and I split this as an appetizer. The reviews were mixed, but mostly positive. Perley and I liked the slight bitterness of the ganache. Sarah thought it could use just a touch more sugar. Perley thought the donut was a tad bit cakey, but still a tasty treat. The Internet has shrunk the world and brought us all closer together. We no longer have to wait to read about disasters in the morning paper. We now know about earthquakes in Nepal minutes after they happen. Deaths of Google executives are tweeted long before the obituary can be researched, edited and printed. There are bad things about this shrunken world. On the Internet, for example, all of the restaurants seem pretty close to us, so when Sarah puts out a call for breakfast on the “Wayzata side” of Minneapolis, and I find a website for a place in Excelsior, it seems like no problem to make it there for breakfast at 9:00. After all visiting the website took no more clicks than visiting the website of any old restaurant in my East Lake Street neighborhood. It wasn’t until I was in the actual bricks-and-mortar car, driving past actual strip malls that I realized that the Internet had tricked me again. 318 Water Street, which looks so close on the Internet is actually quite a drive from all of our homes (except for the one Sarah and Perley are housesitting). It’s so far in fact, that I even felt a twinge of carsickness on the drive home when my full belly jostled around in the back of Jimmy’s Mini Cooper. Spending most of the morning driving to and from breakfast is going to affect the grade. How can it not? To get the full impact of the distance on my review, picture this: I am a breast-feeding woman four hours past waking up, with no pre-breakfast breakfast on board, having endured a seemingly endless drive past strip malls and bike trails and sprawling suburban schools and more strip malls and a technology-induced tour of a cul-de-sac (no GPS, seriously, just tell us to turn around. We don’t need to drive 0.75 miles out of our way to do it). And just as we neared the restaurant – that shining beacon of hope of finally getting some food – Jimmy decided to park the car two blocks away so that his beloved could get some extra Fitbit steps on the way to the restaurant. About then, Sarah texted me a picture of her mimosa. I tried not to faint. I exaggerate. It’s what we do. Anyway, the location is “main street suburbia”. It’s the kind of place with plenty of antique shops and boutiques and nostalgia for the 1950s (ahh…for the days of Joe McCarthy and brutal redlining and women in the kitchen and glorified conformity). Still it’s a preferable suburban architectural movement to “Bennigan’s suburban hell,” so I’ll take it. Perley informed us as we sat down that four other tables arrived just as we did, and the waitstaff and kitchen were slammed. I regretted again the lack of a first breakfast. It was another hour before I saw any food. The menu is slim. One page, one side. I skimmed it and quickly determined that the best option was the breakfast burrito. In fact the second and third best options seemed like rearrangements of the breakfast burrito ingredients. I could see that only Sarah’s stubborn will prevented her from ordering it. She got some kind of breakfast sandwich. Jimmy and I had no such qualms. He got it with pork and I got it without. Judy ordered one of the breakfast burrito rearrangements, even though she can’t stand even the tiniest bit of spiciness. She only ordered it because she feared we’d mock her if she ordered any of her actual top three choices (granola, fruit and yogurt, or oatmeal). Yes, I just realized that two of our members were afraid to order what they really want because of the judgy mc-judgypants nature of our group. Perley on the other hand clearly has no fear of mockery because he ordered the quiche. When the food finally arrived, it was adequate. It was good. It’s not worth the trek. It was definitely not worth the wait once we finally made it to the table. Luckily, I came for the company, judginess and all, and the company did not disappoint. It’s been too long since we sat down together for the most important meal of the day and shared good conversation and laughter without chasing children or worrying about cleanup. First, let’s be honest. My burrito was only on my plate for about 3.5 minutes before I wolfed the whole thing down. It tasted fresh. I liked the kick of the salsa and the flavor of the chipotle sour cream and the mix of black beans and eggs. I don’t remember a thing else about it. I was starving. I give the experience a B. I’d raise it to an A- if you already live in the suburbs. Hell, if you have to choose between this and a Bennigan’s I’ll give it an A. Please, choose this. Seems like a good sort of place to have around in the suburbs. Full confession. I had to stop for a scone on the way home. I told you I was starving. UPDATE: Joe has provided us with a detailed review of his experience. See below. Last week as we were dipping our toes back into the breakfast club water, we kept it small. Four people. We picked a place well in advance, no muss no fuss, show up for bottomless mimosas and some schmancy French food. Done. Since that was so successful, clearly the next step was to double the size of the club. We don't do baby steps here. Zero to sixty. Here's the problem with a group of eight. EVERYONE IN THE TWIN CITIES LOVES BRUNCH/BREAKFAST. If you are meeting your seven friends for breakfast at 10:30, on a Sunday, you better be prepared for a wait if your chosen restaurant doesn't take reservations. I am terrible at waiting for a table. I hate being stuck in no mans land in the vestibule, jealously ogling every plate that come out of the kitchen. I feel guilty about sending, "Finish your food, pay your bill and leave" mental daggers to all of the people who were smart enough to arrive before you. In a perfect world, we'd all get the Copacabana treatment in Goodfellas. Kudos to the Mill for having tiny warm muffins for the sad patrons waiting for their table. A tiny warm muffin is almost as good as getting your own special table at the front of the restaurant. Our locale was chosen because it is close to the best hair salon in the upper midwest and Rachael and I had appointments at nine to get prettied up. I suggested everyone meet at 10:30 at the Mill. Aren't I a nice person for picking the place and time? Avoiding all the discussion and confusion about where to go? Or am I a devious super genius who knew we wouldn't be done with our haircuts until 10:45 so by the time we got there we might already have a table ready for us because my club compatriots are nothing if not prompt? I've heard it both ways. No matter, the angels sang, seas parted, and Rachael and I strolled past two groups waiting for a table and sat right down to a solid brunch at the Mill NE. There is really only one issue I have with the Mill. And that is the volume level. So, so loud. With a group of 8 I felt like I only ate brunch with four people. My friends at the end of the table were essentially out of ear shot. This is not a problem specific to the Mill though, and I feel bad faulting them for it. It's the new normal. Maybe one day someone will open a restaurant with walls made entirely of that recording studio acoustic material. Until then we must trudge on, yelling to our table-mates. The food at the Mill is solid, but not perfect. I'd recommend checking it out at least once, but I don't say drop everything and make this your destination every weekend. Grades below. Amadeus. The Buddy with Italian sausage, fries instead of roasted chevre potatoes, and about 52% of the mimosa pitcher. There are some things for which american cheese is made. An egg sandwich is one of those things. Skip those fancy cheeses with my egg and muffin, just give me that melty yellow square of salty deliciousness. Tubular sausage is a sub-optimal format for a sandwich however. Especially when it is cut lengthwise and then tetrised onto the bun. A patty would have been preferable. The fries were cooked perfectly. Solid B.
Rachael. Cubano central, mimosa and Bellini. The meat was very good, bread not so much. Rachael wants her Cubano to get the panini treatment. Kind of a gut bomb, but that is exactly what a Cubano should be. Fries not as good as Le Town Talk. A-/B+. Sarah. Cubano central. The meat was quite good, but the spicy mustard was overpowering. Nice atmosphere (Sarah apparently is fine not hearing her tablemates, I am somewhat unsurprised). B.
Perley. Ecuadorian baked eggs, mimosa, bloody Mary, and coffee (props for having three different drinks in the same meal!). The bloody was totally weak sauce, no backbone. Eggs had good flavors, but not mind blowing. Good coffee. C+. Brian (NEW MEMBER!). Ecuadorian baked eggs, bloody Mary, coffee, and a beer (another three beverage meal). "I like beans with breakfast so this was right in my wheel house. Also, there was Cholula on the table. Points for that. The bake was a little saucy and, dare I say, a little too cheesy. The potatoes with chèvre were tasty, but a bit incongruous with the meal. Waitress did a good job splitting up the bill. I'll say B+. I've had better bloody Marys but the pickle was tasty and pretty spicy." Maria (NEW MEMBER!). The buddy and fruit. Basically just English muffin with American cheese and an egg. Like a Mcmuffin but fancy. Fruit was amazing. Actually worth the five dollars. The mimosa was good. Perfect combination of orange juice and champagne. B.
Cathy (NEW (KIND OF) MEMBER!). Blue gill tacos. Perfectly cooked with just the right amount of cornmeal. Salsa with mango was a nice touch. Would have liked the corn tortillas to be steamed more. Fries were a bit on the soggy side. Enjoyed the complimentary strawberry chocolate mini-muffins while waiting and the drink option. Bloody Mary was a little watery, but spicy pickle garnish was a plus. Tried some of Joe's biscones and did not like the chevre potatoes. Was kind of gummy and potatoes not really crispy. B+. Joe (NEW MEMBER!). Biscones with gravy and a side of sausage. Loved the eggs, biscones and gravy. Not a fan of the potatoes. No grade provided on account of having to leave on a jet plane. "Pro: mini-muffins at the hostess stand. Perfect for the few minutes we had to wait to be seated, and still warm! Pro: while waiting for a table the hostess got drinks for our party. Con: would have liked a bit more information about the beer selections. I could have asked the waitress, but it was loud enough and busy enough that it would have taken too long and been a pain, so I just drank water instead. Pro: biscones - just a little sweet, and not overly large. I love biscuits and gravy but never get them (or make them) because it's just too much food. This was a perfect size. The mushroom gravy really complemented the biscones, despite the waitress's surprise at my choice. Con: chevre potatoes - these were disappointing. A bit too cheesy, and not crispy enough. Pro: side of Italian sausage - cooked just right. The prices were fine for a restaurant sourcing locally, and with plenty of good options on the menu, I'll definitely be back, probably to try the quiche, French toast, hash, wild rice pancakes and/or the meatloaf sandwich. I usually grade restaurants based on expectations, with a C-grade meaning it met but didn't exceed them. The Mill Northeast gets a solid B+, with the potential for higher on the next visit." We're back. Maybe. I wouldn't hold your breath, we've said that before then disappeared just as quickly as that first cup of coffee in the morning. We were only four this morning. Rebirth of breakfast club has to come in small steps. If we started planning a full breakfast club with all charter members, we'd have a date and place set some time in October. Four is a manageable number for the 8am text, 'Town Talk at 9?'. So we assembled, me Rachael, Sarah and Perley. 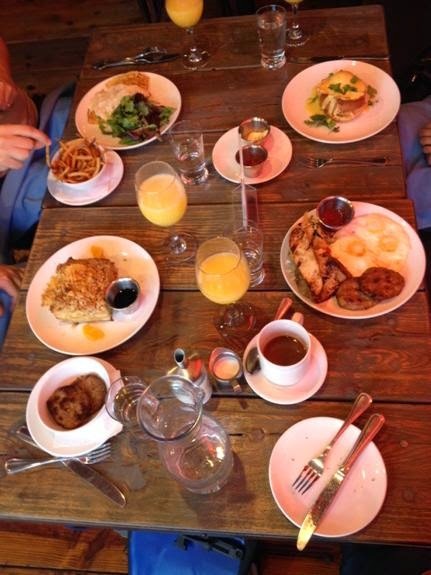 The siren song of bottomless mimosas could not be ignored. The Town Talk is not a new venue for us. It has, however been nine (9!!) years and approximately four different owners since we've brunched there. Despite the change, the trusty old light-up sign remains, which provides me with a strange comfort. The current iteration is a French endeavor so all they had to do was add a "Le" to the sign. It good to know that is all you have to do to French something up. Pardon me while I put on my le shirt, les pants, and les shoes and ride my le bike to your le diner. Ooh la la! What I miss most about breakfast club is the conversation. We're a close-knit group that stays in regular communication, but it is different around the breakfast table (with bottomless mimosas). That's where life's truly important questions are answered. Today's deep thought was: If you could only eat one food item for the rest of your life, what would it be? This was spawned by Perley's recollection of a crazy friend of his parents who decided to eat only squash. It seemed to work out for him, until he turned orange. It can be any food item, but not something like a burrito or hamburger. Individual food item. You were allowed to prepare it different ways, and add spices, but not other additional ingredients. Since we were at breakfast, and I love breakfast above all other meals. I chose the trusty egg. Lots of variation available depending on mode of preparation. It was universally agreed to be a solid choice. Sarah chose an equally versatile and practical food, rice. No complains there. Then things got weird. Rachael chose to go down in a delicious blaze of glory and chose chocolate as her only food for the rest of her life. Even if that life was shortened due to her diet, she'd go happy. If I was given a thousand choices, I would never, ever have gotten Perley's initial choice. Kimchi. KIMCHI. He immediately realized the tiny box that he had put himself in and backed it up. In order to give himself more variety he modified his choice to cabbage. That gave him his beloved kimchi and also coleslaw, sauerkraut, and other delicious options. I love this group. We did manage to eat real food from Le Town Talk. There were some real winners and I think we all enjoyed our meals overall. Those who chose poorly (thumbs pointed inwards, mouthing the words "this guy") were disappointed, but it was their own fault. Our server was great despite the fact that she was pulling double duty due to a no-show. On to the grades. Amadeus. French toast bake with a side of sausage. This thing was the size of a French bulldog. So big that the very center had some cold spots. The thimble of syrup that I was given was not enough to alleviate the dry texture. The sausage was spectacular though. And I am writing this post 7 hours later not having eaten anything since. It'll stay with you for a while. For better or worse. It DID give me enough energy to bike all the way to St. Paul for the craft fair into the wind. Energy by French toast, decision making by mimosa. I'm wiped out. C.
Rachael. Ham crepe with a side of frites. The frites were perfectly cooked. The crepe was very good, if not a little light on the ham. Fresh herbs in the eggs were appreciated. Excellent vinaigrette on the salad. A-. Sarah. Madame Benedict. Needed more ham (sensing a theme? ), but very good. Full half-letter grade improvement for the attentive mimosa service. B+. Perley. Le breakfast. Good sausage and near-perfect coffee but the potatoes were terrible and the eggs were cooked harder than ordered. Straight B. Breakfast club is getting old. Not old in the sense of boring, we've got better things to do than go to breakfast and write about it (we don't). But old in the sense of, people decline a breakfast club invite because they are "tired", or "have a bulging disc (not bulging di_k) in their back", or are late because the baby fell asleep and they didn't want to wake the baby (DON'T WAKE THE BABY). Yesterday's breakfast adventure required no fewer than 12 emails during the week and 7 or 8 texts over the course of Saturday morning. Even with all this planning, only five and a half club members convened at Common Roots Cafe. And that included one member showing up at nine, waiting around for a while by herself, then leaving. Only to make a triumphant return in the middle of the meal because she went home and deemed the house to be too boring since people were just sitting around reading the paper. I was nominated to choose the location for breakfast club because Alex's original suggestion fell through due to that location's unwillingness to serve brunch on Saturday. I took this opportunity to be 100% selfish. I chose Common Roots because it allowed Rachael and I to be P.O.S (part of the solution!) and ride our bikes to breakfast. I got a new bike a couple of weeks ago so we are working on using bikes as our main form of transportation during the weekend. Even if it means we nearly break our backs hauling a week's worth of groceries home from the Wedge (first world problems, amiright?). We want to love Common Roots. This place is completely in our wheel house. Unfortunately their breakfast service keeps us from being all-in on Common Roots. We want to like them so hard that I am not going to even call the bad things bad. I am using that awesome HR term, "areas for improvement". Let's start with the good though. If you need a quick, on-the-go breakfast you can't go wrong with their bagels. They may be the best in the Twin Cities. They also always have a great selection of fresh cream cheeses. The bakery items look absolutely delicious, although we haven't sampled them. The space is homey and comfortable with enough seating to accommodate large groups. Service is quick and responsive (for counter service). Alex was a champion yesterday, wandering around attempting to get enough ketchup for each person. Areas for improvement: Eggs, hash, Chai tea, ordering process (clumsy during busy times), turkey sausage. See grades below for full description. Amadeus-Farmer's breakfast with bison sausage and eggs over easy. The eggs were over hard, which robbed me if my favorite part of the meal, dipping my toast into the egg yolk, full grade deduction. Bison sausage was awesome. B-. Rachael-Sweet potato hash with bison sausage. Not nearly enough sweet potato. Liked the bison sausage. Chai tea was neither strong nor spicy enough. B.
Alex-Sweet potato hash with bison sausage. Too few sweet potatoes, not crispy at all. Watery Chai. C+. Patrick-Sweet potato hash with turkey sausage. Patrick had sausage envy and wanted Rachael and I to engage in trickeration to get Alex's bison sausage (we chickened out though). Turkey sausage was bland. B with bison sausage (he thinks), C with turkey sausage. Judy-Bowl of fruit. She doesn't know how to text her grade to me, but does it really matter? It was just a bowl of fruit. Baby L (new breakfast club member!! )-Three cooled squares of sweet potato mashed around his fingers and his dad's sweater, a gnawed on soup spoon, and a little bit of breast milk (not on the menu). No grade, I'm pretty sure he doesn't know his letters yet. But I predict that he will learn how to text before Judy does. Hey there. How has everyone been? Did we miss anything? Don't get your hopes up. We might be back and regular breakfast club posts will make their triumphant return. I might write this post and then go back in to hiding for two more years. I've heard it both ways. We promise nothing. The good thing about taking a couple of years off of writing about breakfast is that it means there are approximately 9,000 new places to choose from. At least we won't be able to use the, "Geez, there no more places to review in the Twin Cities" excuse. That was a piss-poor excuse given the places that we didn't review in our previous life. Details. Since I am just dipping my toes in the blogging water I thought it'd be smart to convene a small group for breakfast. It was only four of us that arrived at Sun Street Breads on Saturday morning. It's a good thing it was only four of us though, Sun Street is a pretty small place with only one table large enough to accommodate the full club. It's been around long enough that people showing up looking to smell the new restaurant smell may have dwindled but the crowds remain due to their quality fare as witnessed by their very good reviews. Add us to the chorus. There were very few complaints about Sun Street. My only problem was the counter service. I was forced to (gasp!) get up out of my chair to get my coffee refill. The order at the counter, then find a table to sit could easily devolve into a lord of the flies situation if the line got big enough. My own personal anxiety increased as Rachael and I waited in the vestibule for the breakfast club treasurers to arrive so we could order. As each group waltzed in ahead of us I thought to myself, "There goes another four-top table". I may have anxiety problems though. The space is quite nice as well. Even though the seating area is small, the tables don't feel cramped. The bakery is open and visible from the seating area. I may be am weird, I find it mesmerizing watching someone knead bread. Hopefully I didn't make it too creepy for the baker. The food grades are below but TCBCB gives Sun Street our seal of approval. Amadeus-Standard breakfast with sourdough toast and sausage with a side of potato gordos. Perfectly cooked eggs, delicious toast, and incredible sausage. The only miss was the gordos, which are deep-fried mashed potato balls. Gimme plain old hash browns or fried potatoes any day. A-. Rachael-Biscuit sammich, with over easy egg, sausage, and Jarlsberg. Delicious, and pleasantly ungreasy. The only downgrade is due to the gordos. A-. James-Standard breakfast with sourdough toast and sausage. B.
Judy-Standard breakfast with wheat toast and bacon. Also not a fan of the gordos. A-. Warning! The story below has nothing to do with breakfast. Last month Rachael, Sarah, and I took a three week vacation to Southeast Asia to visit friends living in Kuala Lumpur. We spent time in Malaysia, Thailand, Cambodia, and Vietnam. It was the perfect vacation. I figured the best way to document our time is to tell a story from our vacation at the end of each post that I write here (starting a whole nother blog dedicated to our travels was far too much work). Those of you bored by travelogues can stop reading right now. Our first destination on our vacation was Krabi, Thailand. We spent four days there recovering from our journey to the other side of the world by lounging in the pool of our rented villa. After three days of doing almost nothing, we decided that since we were actually by the sea, we should probably at least see it. We signed up for a sunset BBQ snorkel cruise so we could get out and explore the islands of the Andaman Sea. Once we got on the boat and had the briefing we discovered that Kon-Tiki is a Swedish group catering to Swedish travelers. We knew at that at the very least everything would be very safe. As we departed we also learned it would mean that everyone else would smoke approximately eleventy billion cigarettes over the course of the trip. The snorkel part of the trip turned out to be a bit of a disappointment. Once we got in the water at Bamboo Island it was discovered that the current was much stronger than anticipated. Everyone ended up getting swept away from the reef. The positive side is that rather than have us fight our way back to the boat against the current, they towed us back to the boat with the dinghy using a rope that they dropped in the water. This allowed me to pretend that I was James Bond sneaking on to a super villains luxury yacht. I'm lucky I am easily entertained. They fed us some Farang BBQ on our way back from the island. The food was not at all memorable (especially after days of gorging on real Thai food). An incident with one of the staffers was way more memorable than anything else that day. All of the staff members were young multi-lingual Swedish transplants and uniformly nice. But was one a little too nice? Fast forward to the middle of dinner. After standing off to the side pretending not be watching us, one of the young female staffers walked very determinedly up to me and said what sounded like, "Faherdie derdie lerdie do?" Once I realized she was asking me a question, I replied with, "I'm sorry I don't understand..." and before I could finish she dropped her head, turned around, and walked away. My only conclusion based on her reaction is that she was clearly propositioning me. She strategically avoided me for the rest of the cruise so I never got a chance to clarify. Rachael remains unconvinced of my conclusion. Nevertheless, every time we talk about that cruise it allows me to remind Rachael it was the time I got hit on by a Swedish girl. Now that's a once in a lifetime opportunity.